my grandfather’s cousin belle was born in new york, grew up in detroit and moved to los angeles in the early 1940s. she was a businesswoman – owning, according to my mom, a company that manufactured reeds for musical instruments, and her death certificate says she was a owner of a music production company of some kind. 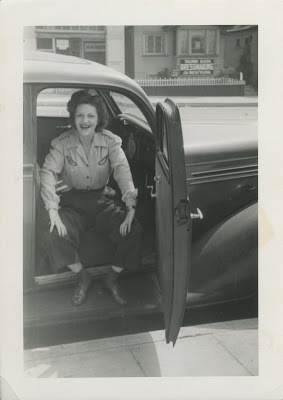 when my grandparents frank and ethel married and moved to l.a. she was a close friend of theirs and i can see why: besides the simple fact that she was my grandfather’s first cousin, she looks like fun. she looks like the kind of person who laughed easily, didn’t bow out of a good time, and would tell funny jokes; the kind of person who drank black coffee, smoked cigarettes and called people “doll” without any sense of irony. the kind of person i would probably like. but belle was also a lesbian. this meant that despite the fact that she was a great pal of theirs, my grandparents distanced themselves from her when they became the parents of two daughters. it wasn’t the fact that they became parents and that they had no more time for fun, but the simple fact that she was a lesbian and they had two daughters. they didn’t cut her out completely – my mom played the flute when she was a kid, a flute that belle gave her – but they did push her away from their little family on purpose. i know that it was ignorance that did this – that maybe they told themselves they, as mature adults, had no problem with belle’s “choices” or “lifestyle” (not “sexuality” or “orientation” or “identity”) but that such an influence could be somehow pernicious to young, unformed girls. or maybe they were worried about what people would say. i can understand and appreciate the time and place in which this decision of theirs was made. that doesn’t really change it. it still doesn’t change how sad it makes me to see this picture, to know the history, and to know that with the passing years, belle and my grandparents fell out of each other’s lives completely. she didn’t know – unless maybe she read the obituaries – when they died the year before she did, mere miles away in the same city. and we didn’t know when she died, didn’t know anything of her at all, until i found the records several years later and saw how close in space we were to one another, but how far apart the ties had stretched. i’m sorry, belle. i wish i could have made up for it somehow. I cannot believe I did not comment on this one. What a touching and heartbreaking story. She looks like she was fun.